I have a little blurb in the July issue of Illustration Magazine. This publication comes out of Japan. 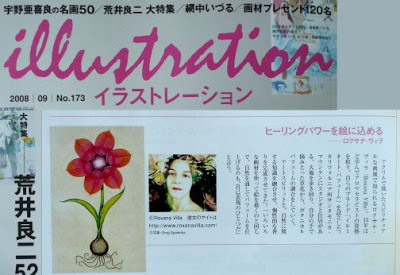 The little feature is in the news from foreign illustrators' pages. We were all excited to peruse the magazine when it arrived, as we adore Japanese culture and illustration. During art school days this was one of the magazines that we would all check out on a monthly basis for its excellent worldwide coverage of the field. For those that do not read Japanese, like me, the editor was kind enough to e-mail me the translation. She apologized for the translation from one language (culture) to the other. I don't feel it sounds awkward at all. 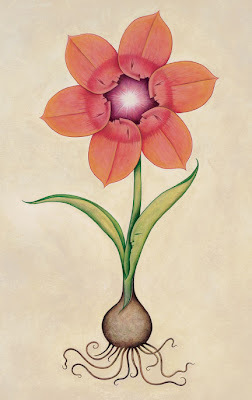 certified in Aromatherapy, she started her company "Illuminated Perfume". as an artist working in several mediums"
Thank you Keri and the publishers of Illustration Magazine for including me in the wonder filled publication. It is an honor and I so look forward to visiting Japan one day soon! Image of painting above Botanicus©Roxana Villa and a montage of the little blurb with the cover of the magazine. Congratulations! And what lovely text you got. Well deserved! Luis, gee I wonder what you wrote? Is it Japanese or code? Hey, did you know that Julia Childs was a spy? Hello Irish Nymph, thanks for the comment, I think it's pretty cool too! Thank you Andy, have you been to Japan? I can't wait to go one day. I love using Yuzu (Japanese citrus) in perfumes. Ref Julia Childs, yes as a member of the OSS. Well, I was in Japan twice for business reasons. And I loved it so much. You would love it , too...for sure!